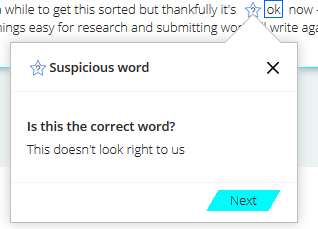 What does the 'Suspicious word' feedback mean? Sometimes, a word is marked as a 'suspicious word'. This article explains what that means and what you should do if you see this feedback. the system is uncertain because 'the cars' is sometimes correct (when it refers to specific cars that have been mentioned before), and sometimes incorrect (when the learner is talking about cars in a general way), but has been marked incorrect by the teachers enough times to create doubt about it. 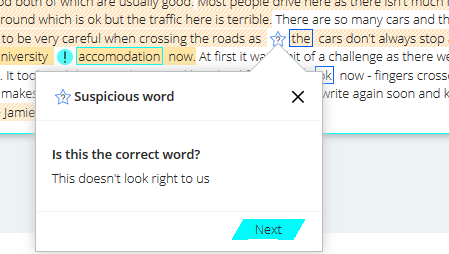 Because the system is not context aware (it cannot tell whether 'cars' have been mentioned before, for example) but has seen 'the cars' marked incorrect a significant number of times, it gives it the 'suspicious word' feedback. It is not saying that it is wrong, but that there is a possibility it is wrong. The learner must think for themself and decide based on context and their learning of the use of the definite article.